New Delhi : One of the abiding pleasures of travel is that it never ceases to surprise. And so it was in Sydney when on my way to catch a bus I heard a name that rung a bell -- Dave Sharma. It turned out to be a fascinating story of a recent trip that gave a glimpse into Australia's vaunted multiculturalism. The beach -- a vast stretch of fine sand merging into the curling oceanic waves -- was swept by rain and wind by the time we reached there. Against the backdrop of the vast Pacific Ocean, a lonely runner was measuring his paces in the sand. Holding our umbrellas with great difficulty in the gushing wind, we took quick photographs and rushed back. He was the ruling Liberal party candidate for Wentworth, a seat vacated by former Australian Prime Minister Malcolm Turnbull, following a rather bitter internal battle and the contest was being watched closely in the world capitals. He eventually lost, a result predicted earlier. But he also underlined the city's and country's plural ethic and open to people from different ethnicities and cultures. We went quite a few times to Oporto -- a Portugese-themed fast-food restaurant -- for quality of its food as also warmth of its staff. It had Indian students working there on a part-time basis and it was interesting to know their stories and ambitions. The restaurant had a variety of burgers, wraps and snacks along with sides and dips on the menu. 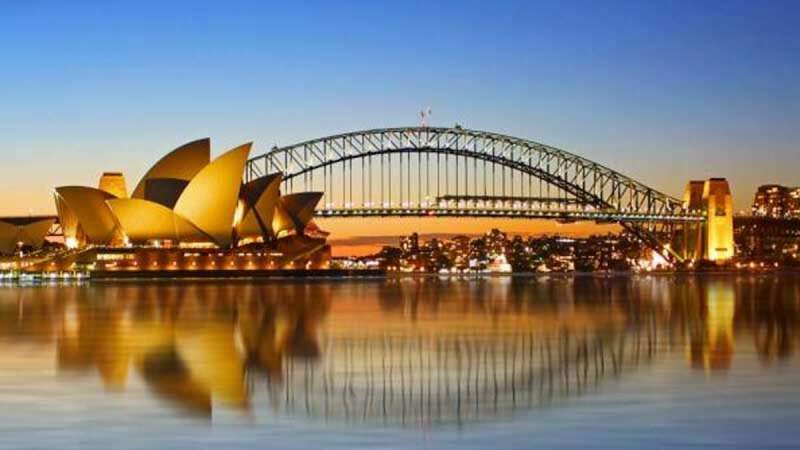 The cruise allows a good view of the Sydney Harbour Bridge -- the largest steel arch bridge in the world -- and the view from below it revealed the enormity and solidity of its construction. It was opened in 1932. We did most of our shopping from Paddy's market near the CBD which has stalls selling a variety of wares including jewellery, souvenirs, accessories and dresses. The adjoining mall also had good bargains.